How effective is the communication you experience every day? How often have you been bored during a presentation? Failed to win a piece of business that, deep down, you know you should have won? Had a tedious, pointless networking conversation? Countless times, no doubt. Too much information and not enough relevance is a problem that pervades almost all business communication. You see, the way many people communicate is like filling a bucket with jelly, flinging it at their audience, and hoping some of it sticks. It's ineffective, it's irritating and, above all, it's very messy. So what's the answer? More relevance and a lot less jelly. 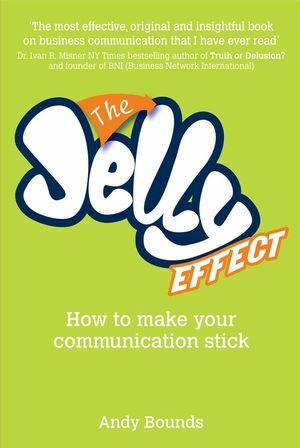 The Jelly Effect teaches you simple, memorable and costless ways to win more attention and more business. Imagine how effective you'd be if you communicated only what was relevant 100 percent of the time. You would be better at talking to others, presenting, networking and selling. You would excel in interviews, meetings and pay-rise discussions. The benefits would be endless. Andy Bounds is an expert at showing organisations how to make their communication work. His unique slant on communication stems from the fact that his mother is blind, giving him a lifetime of explaining things from someone else's point of view. Andy shares this unique knowledge with companies and conference audiences all over the world, and it's helped thousands of businesses win significant sums of money by teaching tem what to say so that their clients feel comfortable, helped and - most importantly - 'keen to buy'. Who am I to tell you how to communicate? Chapter 1. The best way for you to read this book. Chapter 2. Why 'the Jelly Effect'? Chapter 5. How to sell more. Chapter 8. Avoiding 'the Green Corridor of Doom'.